Shriram Transport Finance Company Limited (STFC) is launching its public issue of non-convertible debentures (NCDs) from today, June 27, 2018. This will be the first public issue by the company after a gap of four years. The company plans to raise Rs. 5,000 crore from this issue, including the green shoe option of Rs. 4,000 crore. These NCDs will carry coupon rates in the range of 9.03% to 9.50%, resulting in an effective yield of 9.19% to 9.51% for the retail individual investors. The issue is scheduled to close on July 20, unless the company decides to foreclose it. Before we take a decision whether to invest in this issue or not, let us first check the salient features of this issue. Size & Objective of the Issue – Base size of the issue is Rs. 1,000 crore, with an option to retain oversubscription of an additional Rs. 4,000 crore, making the total issue size to be Rs. 5,000 crore. The company plans to use the issue proceeds for its lending and financing activities, to repay interest and principal of its existing borrowings and other general corporate purposes. Coupon Rate & Tenor of the Issue – The issue will carry coupon rate of 9.50% p.a. for a period of 10 years, 9.40% p.a. for 5 years and 9.20% p.a. for 3 years. These rates would be applicable for annual interest payment only. Monthly interest payment option is available only with 5 years and 10 years tenors, and coupon rates for these periods would be 9.03% p.a. and 9.13% p.a. Respectively. 0.25% Additional Coupon for Senior Citizens – The company has decided to offer an additional coupon of 0.25% p.a. to the retail investors, as well as HNI investors, who hold these NCDs on the relevant record date for the purpose of interest payment. Credit Rating & Nature of NCDs – CRISIL and India Ratings have rated this issue as ‘AA+’ with a ‘Stable’ outlook. Moreover, these NCDs will be ‘Secured’ in nature. Listing, Premature Withdrawal – These NCDs are proposed to get listed on both the stock exchanges, Bombay Stock Exchange (BSE) as well as National Stock Exchange (NSE). The listing will take place within 12 working days after the issue gets closed. Though there is no option of a premature redemption, the investors can always sell these NCDs on the stock exchanges. Demat A/c. Mandatory – Demat account is mandatory to invest in these NCDs as the company is not providing the option to apply for these NCDs in physical or certificate form. TDS – Though the interest income would be taxable with these bonds, NCDs taken in demat form will not attract any TDS. The investor will have to pay tax on the interest income while filing his/her income tax return. TDS @ 10% will be deducted if these NCDs are held in physical/certificate form and annual interest income is more than Rs. 5,000. Minimum Investment Size – STFC has fixed Rs. 10,000 as the minimum amount to invest in this issue. So, if you want to invest in this issue, you need to apply for a minimum of ten NCDs worth Rs. 1,000 each. Should you invest in Shriram Transport Finance NCDs? Shriram Transport Finance issued its NCDs in a public issue four years ago in 2014 at an effective yield of 11% to 11.50%. During that time, inflation was still high, but bond yields and interest rates had just started their downward journey. Now, these NCDs are offering an effective yield of 9.19% to 9.51%. So, if we compare NCDs of the same issuer with its previous issues, there is a material downward shift that has happened. But, if we compare other companies’ coupon rates from their latest issues with that of STFC’s coupon rates, STFC scores over other issuers. Moreover, STFC is a fundamentally sound company with a long track record of strong income and earnings growth. It also carries a credit rating of ‘AA+’ with a ‘Stable’ outlook. All these factors augur well for this issue and as interest rates on bank FDs are still ruling lower, this issue gives risk-averse investors an opportunity to invest their surplus money into high yielding NCDs. Many a times you need assistance while handling your finances, but you have nowhere to look for. Instead what you end up doing is either approach others for help or buy some software to solve your problems. But, why be dependent on anyone or spend money when the internet is full of helpful websites. The internet hosts numerous websites with valuable tools that are completely free to use and can be of great help with money management. So, without further ado, let’s read ahead and check what these online tools are and how you can use them. What is it that you are planning to do? Are you looking forward to taking a home loan or a personal loan, or are you interested in filing your income tax return (ITR)? Well, if your answer is yes, then the internet has a host of calculators available that can help you calculate your loan repayment amount or your tax returns. Financial calculators give you a clear picture of what your expenses are going to be. To use these financial calculators, you only require a working internet connection and knowledge of good finance websites that offer such calculators. Once you access these calculators, you are required to put in the details as asked and keep proceeding as per instructions until you reach the result. Buying insurance is gradually shifting online. Online purchase of various plans, including pure term plans, is already drawing the attention of insurers. That is simply because of the online calculators, and very few add-on features of term insurance plans. However, insurance calculators are not just limited to term insurance plans. You can compare the quotes for ULIPs and Pension Plans as well. Insurance calculators are specially designed to help you calculate the required monthly/annual premium if you are thinking of purchasing insurance plans. These calculators allow you to adjust the sum that you want your family to receive in your absence. You can select various features and compare the premium for adding covers to your base plan. For example, term insurance of Rs. 1 crore may only cost about Rs. 11,000 or so for a 30-year-old non-smoker person. But, adding a Rs. 25 lakh critical illness cover may increase the premium by Rs. 2,000 or more. Another example could be the term insurance calculator determining your monthly, half-yearly, or annual premium payments and helping you select the most affordable option. Annual premiums usually enjoy a discount over monthly premiums. It can be a difficult thing to handle money and organize your expenses every month. Well, that can be controlled by budget planning tools available on the internet. These tools allow you to link your credit cards, debit cards, savings accounts, investments and loans all in one place. They also categorize and update every transaction that you make, thus helping you to understand where your money is being spent. This, in turn, helps you discover new ways and opportunities to save your money. Budget planners help you differentiate between the expenses that are a must, as compared to the expenses that are not entirely required. You may be struggling with handling your finances. But, with these tools, you can lead a financially relieved life. These tools can assist you in planning out your financial goals and even predict whether such goals are achievable. The internet is home to numerous opportunities and the same can be said for financial management as well. So, try these online tools today and watch your lives turn around for the best. JM Financial Credit Solutions Limited, a venture between JM Financial Limited holding 50.01% and INH Mauritius holding 48.62%, is going to launch its issue of Non-Convertible Debentures (NCDs) from the coming Monday i.e. May 28, 2018. The company plans to raise Rs. 750 crore from this issue, including the green shoe option of Rs. 450 crore. These NCDs will carry coupon rates in the range of 9.11% to 9.75%, resulting in an effective yield of 9.24% to 9.74% for the retail individual investors. The issue is scheduled to close on June 20, unless the company decides to foreclose it. Size & Objective of the Issue – Base size of the issue is Rs. 300 crore, with an option to retain oversubscription of an additional Rs. 450 crore, making the total issue size to be Rs. 750 crore. The company plans to use the issue proceeds for its lending and financing activities, to repay interest and principal of its existing borrowings and other general corporate purposes. Coupon Rate & Tenor of the Issue – The issue will carry coupon rate of 9.25% p.a. for a period of 38 months, 9.50% p.a. for 60 months and 9.75% p.a. for 120 months. These rates are applicable for annual interest payment only. Monthly interest payment option is available only with 60 months and 120 months tenors, and coupon rates for these periods have been fixed at 9.11% p.a. and 9.34% p.a. Respectively. Credit Rating & Nature of NCDs – ICRA and India Ratings have rated this issue as ‘AA’ with a ‘Stable’ outlook. Moreover, these NCDs will be ‘Secured’ in nature. Listing, Premature Withdrawal – These NCDs will get listed only on both the Bombay Stock Exchange (BSE). The listing will take place within 12 working days after the issue gets closed. Though there is no option of a premature redemption, the investors can always sell these NCDs on the stock exchanges. Should you invest in JM Financial Credit Solutions NCDs? JM Financial Credit Solutions Limited is a relatively new company with a strong promoter background. The company reported revenues of Rs. 103.73 crore during FY 2014-15, Rs. 788.36 crore in FY 2016-17 and Rs. 959.93 crore in FY 2017-18. Profit after tax (PAT) of the company has grown from Rs. 48.80 crore in FY 2014-15 to Rs. 277.25 crore in FY 2016-17 and Rs. 328.29 crore in FY 2017-18. Note: Figures are in Rs. Crore, except per share data & percentage figures. The company has been able to grow its loan book from Rs. 1,844 crore in FY 2014-15 to Rs. 5,658 crore in FY 2016-17 and Rs. 7,339 crore in FY 2017-18. 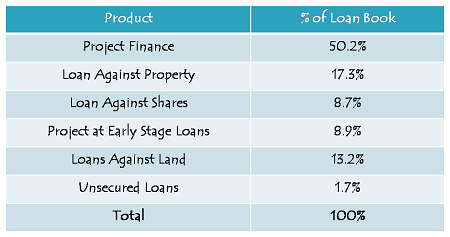 As mentioned in the table below, 50.2% of its loan book is of project finance, 17.3% loan against property, 8.7% loan against shares, 8.9% project at early stage loans, 13.2% loans against land and 1.7% unsecured loans. This issue has been rated ‘AA’ as compared to DHFL’s issue which is rated ‘AAA’. That is because DHFL is a much larger and stable company with a long history of being a loan financier as compared to JM Financial Credit Solutions. There is a coupon rate differential of just 0.50% p.a. for 5 years and 0.65% p.a. for 10 years. So, if somebody trusts the the JM Financial group and its management and wants to reap the benefits of its growth story going forward, then I think investing in its shares would be a better option rather than investing in its subsidiary’s NCDs. Risk-averse and tax-exempt investors, however, can consider investing in these NCDs for a period of 38 months or 60 months, preferably with monthly or annual interest payment option. DHFL, or Dewan Housing Finance Limited, is coming out with its issue of Non-Convertible Debentures (NCDs) from the coming Tuesday i.e. May 22, 2018. These NCDs will carry coupon rates in the range of 8.56% to 9.10%, resulting in an effective yield of 8.90% to 9.10% for the retail individual investors. DHFL plans to raise Rs. 12,000 crore from this issue, including the green shoe option of Rs. 9,000 crore. The issue will remain open for 2 weeks and is scheduled to close on June 4, unless the company decides to foreclose it. Size & Objective of the Issue – Base size of the issue is Rs. 3,000 crore, with an option to retain oversubscription of an additional Rs. 9,000 crore, making the total issue size to be Rs. 12,000 crore. The company plans to use the issue proceeds for its lending and financing activities, to repay interest and principal of its existing borrowings and other general corporate purposes. Coupon Rate & Tenor of the Issue – The issue will carry coupon rate of 8.90% p.a. for a period of 3 years, 9% p.a. for 5 years and 7 years and 9.10% p.a. for 10 years. These rates are applicable for annual interest rate payment only. Monthly interest payment option is available only with 3 years and 5 years tenors, and coupon rates for these periods have been fixed at 8.56% p.a. and 8.65% p.a. respectively. Additional 0.10% Coupon for Senior Citizens – Category III and Category IV investors, who are senior citizens on the deemed date of allotment, will be eligible for an additional 0.10% interest rate provided they hold these NCDs on the record date for the purpose of interest payment. One-Time Additional Incentive on Maturity – Category III and Category IV initial allottees will be paid a one-time additional incentive of 0.50% for the 5-year annual as well monthly interest payment options, 0.70% for the 7-year option and 1% for the 10-year option. This incentive will be paid at the time of maturity and only to those investors who hold these NCDs throughout their respective duration. No such incentive will be paid with the 3-year interest payment options. MIBOR Linked Floating Interest Rate – Like its previous issue, DHFL has decided to offer an option to have floating interest rate with these NCDs. The specified spread will be 2.16% p.a. over and above the benchmark MIBOR for all the categories of investors. Benchmark MIBOR will be computed on an annualized basis, based on the Reference Overnight MIBOR published by Financial Benchmark India Pvt. Ltd. (FBIL), and it will be reset once every year in the second and third year. Credit Rating & Nature of NCDs – CARE and Brickwork Ratings have rated this issue as ‘AAA’ with a ‘Stable’ outlook. Moreover, these NCDs will be ‘Secured’ in nature. Listing, Premature Withdrawal & Put/Call Option – These NCDs will get listed on both the national exchanges i.e. Bombay Stock Exchange (BSE) as well as National Stock Exchange (NSE). The listing will take place within 12 working days after the issue gets closed. Though there is no option of a premature redemption, the investors can always sell these NCDs on the stock exchanges. There is no option either with the company to ‘Call’ these NCDs prematurely. Demat Not Mandatory – Demat account is not mandatory to invest in these NCDs as the investors will have the option to apply for these NCDs in physical or certificate form as well. TDS – Though the interest income would be taxable with these bonds, NCDs taken in a demat form will not attract any TDS. The investor will have to pay tax on the interest income while filing his/her income tax return. Bond yields have been rising for the last 12-18 months, and that too, at an unusually fast speed. Benchmark 10-year government bond yield is currently trading very close to 7.90% levels, while it touched a low of around 6.10% during demonetization period. In August 2016, when the bond yields were trading between 6.70% to 7%, DHFL issued its NCDs with coupon rates ranging between 8.83% to 9.30% and the issue got oversubscribed to the tune of 4.70 times on the first day itself. Encouraged by such an extraordinary response, DHFL came out with its second tranche of a bigger size a few days later, and that too got oversubscribed 1.26 times on Day 1. Going by that experience, I think this issue should also get oversubscribed much before its official closing date. But, despite of the fact that the bond yields have risen by around 2% since demonetization, it is somewhat disappointing to have coupon rates on offer even lower than its August 2016 issues. The current NDA government is about to complete its 4-year term and I expect both equity markets as well as bond markets to exhibit a lot of volatility in the next 1-2 years. Given such a scenario, I think it is time the passive or risk-averse investors should park their money in safer investment instruments. These NCDs too are relatively safer carrying ‘AAA’ rating, except for the fact that DHFL is a private issuer. Coupon rates of 8.56% to 9.10% do not attract me much, despite the issue being rated ‘AAA’. I would rather prefer to invest in debt mutual funds, hoping bond yields to fall once the economy stabilizes post next year’s elections. However, investors, who are not required to pay any tax on their annual taxable income or who fall in the 10% tax bracket, can consider investing in these NCDs for a period of 3 years or max 5 years. As expressed earlier as well, I personally avoid longer term investment periods with private companies, so would advise my clients to avoid longer period investments in such NCDs. After SREI Infrastructure Finance, Edelweiss Retail Finance and Muthoot Finance, SREI Equipment Finance has decided to launch its issue of non-convertible debentures (NCDs). The issue will open for subscription from April 25th and carry interest rates in the range of 8.50% to 9.60% per annum. These NCDs will be issued for a period of 400 days, 3 years, 5 years and 10 years. The company plans to raise Rs. 1,000 crore from this issue, including the green-shoe option of Rs. 500 crore. These NCDs have been rated ‘AA+’ by Brickwork Ratings and SMERA and are ‘Secured’ in nature. The issue is scheduled to close on May 16, but it is highly unlikely that it will remain unsusbcribed till then. Size & Objective of the Issue – Base size of this issue is Rs. 500 crore, with a green-shoe option to retain an additional Rs. 500 crore, thus making it a Rs. 1,000 crore issue. The company plans to use at least 75% of the issue proceeds for its lending activities and to refinance its existing loans and up to 25% of the proceeds for general corporate purposes. Coupon Rate & Tenor of the Issue – The issue will carry a coupon rate of 8.75% p.a. payable on a monthly basis, 9.10% p.a. payable annually and on a cumulative basis for a period of 3 years. For 5 years, these rates stand at 9% payable monthly and 9.35% for annual and cumulative options. The rates on offer are the highest for 10 years – 9.20% payable monthly and 9.60% payable annually or on a cumulative basis. As you can check from the table below, these rates are effectively higher than all the issues that came in the last 2-3 months. For Category I and Category II investors also, these NCDs carry the same rate of interest as it is for Category III investors. No Additional Coupon for Shareholders, NCD Holders, Senior Citizens or Employees – Unlike its previous issue, the company has decided not to offer any additional coupon to the shareholders or NCD holders or the employees of the company or its parent company, and senior investors as well. Minimum Investment – Investors are required to subscribe to at least ten units of these NCDs, thus making it a minimum investment of Rs. 10,000. Allotment will be made on a first-come first-served basis, as well as on a date priority basis i.e. on the date of oversubscription, the allotment will be made on a proportionate basis to all the applicants of that day on which the issue gets oversubscribed. Credit Rating – Rating agencies, Brickwork Ratings (BWR) and SMERA have rated this issue as ‘AA+’ with a ‘Stable ‘ outlook. Debt instruments with such a rating are considered to have a high degree of safety regarding timely payment of interest and principal. Secured NCDs – Unlike its previous issue which offered ‘Unsecured’ NCDs, this issue carries NCDs which are ‘Secured’ in nature i.e. in case of any default on its payment of interest or principal, the bondholders will have the right on certain assets of the company. Listing, Premature Withdrawal & Put Option – These NCDs will get listed only on the Bombay Stock Exchange (BSE) and the listing will take place within 12 working days from the issue closure date. Demat Mandatory except Series IV, Series VII and Series X NCDs – Investors need to have a demat account to apply for these NCDs, except Series IV, Series VII and Series X. Notably, these NCDs will pay interest rates on an annual basis. TDS – Interest income earned on these NCDs is taxable and the investors are required to pay tax on it as per the respective tax slabs they fall in. TDS @ 10% will be deducted if these NCDs are held in physical/certificate form and annual interest income is more than Rs. 5,000. NCDs held in demat mode will not attract any TDS. Should you invest in SREI Equipment Finance NCDs? Financials of the company have improved over the past 12-24 months. The company reported profit after tax (PAT) of Rs. 181.98 crore for the nine-month period ended December 31, 2017, which is higher than its financial year 2016-17 profit of Rs. 148.84 crore. Net interest margin (NIM) as well as net profit margin, both have seen a healthy growth during this period. On the asset quality front too, the company has done well to consistently contain its gross NPAs and Net NPAs. Gross NPAs have fallen from 4.97% in 2014 to 1.99% in 2017. Net NPAs too have fallen from 4.07% to 1.39% in the same period. These NCDs are not for everybody. Risk-averse investors and those who fall in the 30% or 20% tax bracket should avoid investing in them. Also, I think 10 years is a long period to invest with a private company. Investors, with an appetite of taking some risk and who fall in the lower tax brackets, can consider investing in these NCDs for a period of 400 days, 3 years or 5 years. You should consider subscribing for the 10-year option only if you have full faith in the company’s future prospects and also, if you think that the interest rates are going to fall going forward. Out of the eleven options available, I would personally prefer Series VII, the 5-year annual interest payment option, as I would like the interest to get reinvested at 9% on a monthly basis and credited to my bank account at least once in a year. Muthoot Finance is launching its issue of non-convertible debentures (NCDs) in the new financial year starting April 9, 2018. The company plans to raise Rs. 500 crore from this issue, with an option to retain oversubscription to the tune of Rs. 3,000 crore. These NCDs will carry coupon rates between 8% for 400 days and 9% for 60 months. Maturity period will range between 400 days to 60 months, having monthly, annually and cumulative interest payment options. The issue will remain open for a month and is scheduled to close on May 8, 2018. Size of the issue – Base size of the issue is Rs. 500 crore and Muthoot will have the option to retain oversubscription to the tune of Rs. 3,000 crore, including the green-shoe option of Rs. 2,500 crore. 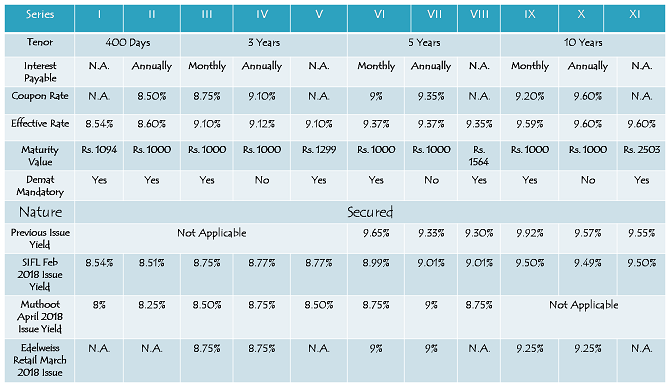 Minimum Investment – Investors are required to apply for a minimum of ten bonds of Rs. 1,000 face value i.e. an investment of at least Rs. 10,000. Coupon Rates – Muthoot has decided to offer interest rates similar to what it offered last year in April 2017. These NCDs will carry coupon rates in the range of 8% for 400 days to 9% for 60 months. All these NCDs will be ‘Secured’ in nature. Double your Money Option Missing – Muthoot used to offer an option to double your money in 8 years (or 96 months). This option was there last year as well, but it was ‘Unsecured’ in nature. However, there is no such option this year. An effective yield of 9.06% p.a. results in doubling your money in 8 years. So, having an option of 9% for 5 years and then reinvesting the proceeds for another 3 years at approximately 9.25% would help you double your investment amount. But, you will have to consider tax effects on the interest payments. Allotment on First-Come First-Served Basis –Allotment will be made on a first-come first-served basis, as well as on a date priority basis i.e. on the date of oversubscription, the allotment will be made on a proportionate basis to all the applicants of that day on which it gets oversubscribed. NRI/QFI Investments – Non-Resident Indians (NRIs), foreign nationals and Qualified Foreign Investors (QFIs) among others are not allowed to invest in this issue. Ratings & Nature of NCDs – CRISIL and ICRA, the two rating agencies involved in this issue, have assigned ‘AA/Stable’ rating to the issue, indicating the issue to be safe as far as timely payments of interest and principal investments are concerned. As mentioned above as well, all these NCDs are ‘Secured’ in nature. Demat Account Mandatory – Muthoot has decided to issue these NCDs compulsorily in demat form. So, if you don’t have a demat account, you won’t be able to apply for these NCDs. Taxability & TDS – Interest earned on these NCDs will be taxable as per the tax slab of the investor. However, as these NCDs will be allotted compulsorily in your demat accounts, no TDS will be deducted from your interest income. Listing on BSE – Muthoot has decided to get its NCDs listed only on the Bombay Stock Exchange (BSE). Allotment as well as listing of these NCDs will happen within 12 working days from the closing date of the issue. Should you invest in Muthoot Finance NCDs? Despite of the fact that the bond yields have jumped by close to 1.5% in the last one and a half years, no company is willing to raise interest rates on their NCDs. In April 2017, when bond yields were far lower than their current levels, Muthoot offered interest rates in a similar range. SREI Infrastructure Finance and Edelweiss Retail Finance, both raised money in the previous quarter by issuing their NCDs and offered interest rates close to what Muthoot is offering in this issue. I think Muthoot, SREI Infra Finance and Edelweiss Retail Finance, all should have offered higher interest rates. But, as long as banks are not willing to raise interest rates on their fixed deposits, these finance companies have the liberty to take this opportunity of raising money at such lower rates. To me, these interest rates are not attractive. I would rather invest my money in debt funds or stocks of fundamentally sound companies for long term or bank FDs of shorter duration. Life without mistakes is a myth. All of us tend to make mistakes at every stage of life – from childhood to adulthood. But, with every mistake we make, we get to learn a new lesson and become wiser and more experienced. While childhood mistakes do not matter, mistakes we make in adulthood matter and sometimes lead to hamper our quality lives, especially if they are financial in nature. Let us go through some of our financial mistakes and try to learn from them. Often, we regret our past mistakes and worry too much about repeating them going forward. In the process, we tend to ignore the fruits of the present. In short, we do not enjoy what we have or make any meaningful life derivative from our today. For example, our worry about the financial uncertainties, or the fear of probable financial concerns in the future. It may or may not happen. Hence, we continue saving money from our limited sources of income. Future is uncertain – we all know that. However, by restricting access to our own income in the present, through savings, is not such a smart thing to do if we do not approach it wisely and prudently. We ought to invest, not save. It is important to ask yourself how much savings and investment we should do in the present to safeguard our future income or other monetary requirements. In that sense, you must let your money grow. The only compounded growth of your income must give you the satisfaction of savings/investment in the present. It is not only our income which is uncertain, but also our future which is not in our hands. We can only do as much to safeguard our future expenses and real-time requirements. Learning from the past mistakes holds the key to a practical future. There is no point in ruining your present because of the mistakes you made in the past. If you have still not saved and invested money, there is no point cribbing or blaming yourself for it. A better approach is to start planning for today. Moreover, it is better late than never. Fortunately, there are many financial instruments, including a mutual fund SIP or a life insurance policy, which you can buy for a fixed tenure at an early stage of life, say age of 18 years or so. Though there is no age limit as far as mutual fund investments are concerned, insurance companies however do set an upper age limit to buy an insurance policy. So, if you have not invested so far, there is no point delaying it further to secure a financially stable future. While budgeting for your family expenses, you should consider the depreciating value of money. If you are just living by the present standards of living, and not considering the money needed to secure your future, you are making a grave mistake of not having a sound and viable living in the future. There is a need to invest, and there is a need to do that smartly. By choosing to spend your time and money only on the present, is like turning a blind eye to the road of life ahead. It can be full of minor bumps and more significant uncertainties. A life insurance plan, for example, is a prudent investment to have monetary access in the future as well. You need to evolve financially for a safe and secure future. The proverb, hope for the best and prepare for the worst, has a different connotation when you are planning to budget or invest in the future. It should be hope for the best and plan for the worst. One should be optimistic in life, agreed, but that should not deter you from planning for the future especially when it concerns the matters of finance. It needs more time and effort for you to prepare for the life ahead. Life is full of uncertainties and to cover up financially, you may need the assistance of an insurance policy to help you overcome any real obstacle in the needy times. So, an insurance policy can provide you financial assistance and protection against life uncertainties like death of the bread winner (giving money equivalent to the value of your income at ‘that’ given point of time), simple savings plans, retirement plans, health plans, thus, ensuring the fact that you have money when you need it the most. ICICI Securities IPO Review – Should You Invest or Not @ Rs. 519-520? Note: Market Caps and Market Prices are dated March 20, 2018. EPS have been annualised taking 9-month EPS as on December 31, 2017. Should You Invest in ICICI Securities IPO @ Rs. 520? Suppose, you buy 100 shares of Infosys at Rs. 1,100 with a price target of Rs. 1,150 in say a month or so. But, within a week, without any positive news or development, its stock price zooms to Rs. 1,150 odd levels. You book your profits in this trade and start expecting the stock price to come down the very next moment you sell it. It doesn’t come down and moves to Rs. 1,200 within a fortnight. You don’t buy it, but decide to buy it again at Rs. 1,150, the same price level you sold it at. It comes down to Rs. 1,150, you buy it again at Rs. 1,150 and decide to sell it at Rs. 1,220. It goes down till Rs. 1,100, but you don’t sell it as you had decided to sell it only when it touches Rs. 1,220 or more. It goes up again to touch Rs. 1,220 levels, you sell it at Rs. 1,220 and again start expecting it to come down as you had just sold it in the expectation of its price to come down. This way, you buy and sell Infosys five times as it reaches Rs. 1,350. This is just a hypothetical example, but I think something similar happens with many of us in a bull market. But, when the markets start correcting or a bear market takes over, we don’t square-off the same Infosys position at Rs. 1,050 (bought at Rs. 1,100 in the anticipation of Rs. 1,150). Not even at Rs. 1,000. Not even at Rs. 950. Not even at Rs. 900. Not even if goes down to Rs. 600. Then we stop logging on to our trading platforms, become investors (from traders) and decide to sell our holdings only when they bounce back to our cost price. Though something of this sort does not happen with every trader or investor, but something similar is common with most of us. I think you would agree. So, in a bear market, we trade less frequently, and in turn, our broking firms get less brokerage from us. Similarly, in a bull market, we make money and in turn, generate good brokerage for our broking firms. Something similar happened in the first three quarters of the current financial year and like most other broking firms, ICICI Securities too raked the moolah out of it and its 9-month revenues and profits in FY 2017-18 exceeded its full year revenues and profits of FY 2016-17. 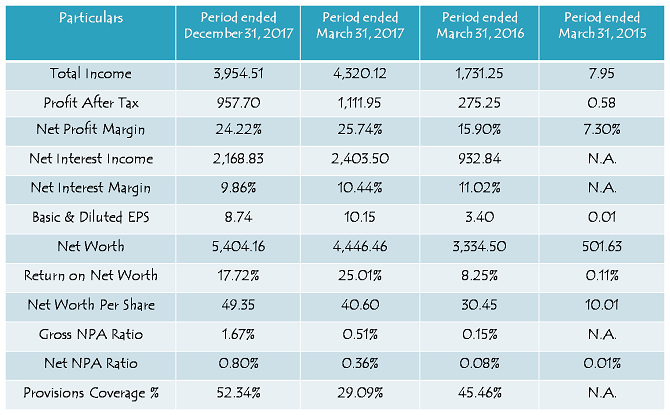 Even with best of its financial performance, the price/earnings multiple ICICI Securities is seeking in this IPO is at 31.48 times its 9-month annualised EPS for the current financial year. I think it is on a higher side, as I don’t expect stock markets to have such similar uninterrupted upswings on a consistent basis. Like stock markets, financial performances of broking companies too are volatile. The company had an EPS of Rs. 7.41 during FY 2015-16. Imagine a similar year in which the company earns an EPS of say Rs. 8. At Rs. 520 a share or above, it would be valued at 65 times or more. So, if you are a bull right now and have a view that the Indian stock markets will have a healthy upward movement in the next 3-5 years, and most importantly, ICICI Securities will be able to cash it one way or the other, then you should definitely subscribe to it. Conservative or risk-averse investors should avoid it. Author Shiv KukrejaPosted on March 22, 2018 March 26, 2018 Categories IPO/NFO16 Comments on ICICI Securities IPO Review – Should You Invest or Not @ Rs. 519-520? ICICI Securities Limited, a wholly-owned subsidiary of ICICI Bank, is entering the primary markets with its initial public offer (IPO) of 7.72 crore shares worth Rs. 4,017 crore. The offer would constitute 23.98% of the company’s post-offer paid-up equity share capital. Price band of the IPO is in a very narrow range of Rs. 519-520 a share and no discount has been offered by the company to the retail investors. The issue is getting opened for subscription from Thursday, March 22 and will remain open for three business days to close on March 26. This IPO is a 100% offer for sale (OFS) by its promoter ICICI Bank and hence ICICI Securities will not get any money out of this IPO for its further expansion. Only 10% Issue is for Retail Investors – Only 10% of the issue size, excluding the portion reserved for the ICICI Bank shareholders, is reserved for the retail individual investors (RIIs) i.e. approximately 73.38 lakh shares out of total 7.72 crore shares on offer. 15% of the issue is reserved for the non-institutional investors (NIIs) and the remaining 75% shares will be allocated to the qualified institutional buyers (QIBs). Bid Lot Size & Minimum Investment – Investors need to bid for a minimum of 28 shares and in multiples of 28 shares thereafter. So, a retail investor would be required to invest a minimum of Rs. 14,560 at the upper end of the price band and Rs. 14,532 at the lower end of the price band. Maximum Investment – Individual investors investing up to Rs. 2 lakh are categorised as retail individual investors (RIIs). As a retail investor, you can apply for a maximum of 13 lots of 28 shares in this IPO i.e. a maximum investment of Rs. 1,89,280. Objective of the Issue – As the entire issue proceeds will go to ICICI Bank, being the promoter of the company, the primary objective of the offer for ICICI Securities is to enhance its visibility and brand image by getting listed on the stock exchanges. Bandhan Bank IPO Review – Should You Invest or Not @ Rs. 370-375? For the financial year ended March 31, 2017, Bandhan Bank reported a total income of Rs. 4320 crore as compared to Rs. 1,731 crore it reported during financial year 2015-16, registering a growth of 149.57% in the last one year. The bank reported profit after tax (PAT) of Rs. 1,112 crore for the financial year ended March 31, 2017 as against Rs. 275 crore for the financial year ended March 31, 2016, posting a growth of 304% CAGR. Bank’s net interest margins (NIMs) are the most impressive at 10.44% in FY 2016-17, which have fallen marginally to 9.86% during 9-months ended December 31, 2017. However, its asset quality has also deteriorated somewhat, but given the market scenario, it is still well within investors’ comfort zone. Should you subscribe to Bandhan Bank IPO @ Rs. 370-375? Having commenced its banking operations in August 2015, Bandhan Bank is a relatively new bank, with 887 bank branches, 430 ATMs and 2,633 doorstep service centres (DSCs). Bandhan Bank’s distribution network is particularly strong in east and northeast India, with West Bengal, Assam and Bihar together accounting for 56.37% and 57.58% of its branches and DSCs respectively, as of December 31, 2017. Though its net interest margins (NIMs) stand healthy at 9.86% as on December 31, 2017, I don’t think the bank will be able to maintain such NIMs going forward. As the bank expands its base and reaches out to other areas where it does not currently have exposure to, its margins are bound to go down. As far as its asset quality is concerned, the bank has so far been able to maintain it at a remarkably low levels. But, there too, the NPAs are bound to go up as the bank diversifies its operations and expands its loan book. As the issue gets closed on Monday at Rs. 375 a share, Bandhan Bank will have a market cap of Rs. 44,730 crore, price to book value of 4.53 times and price to earnings ratio of 32.19 times its FY18 earnings. As compared to Bandhan, RBL’s market cap is Rs. 19,962 crore, P/BV ratio is 4.12 times and P/E ratio is 32.49 times, Yes Bank’s market cap is Rs. 71,934 crore, P/BV ratio is 3.23 times and P/E ratio is 17.96 times, and IndusInd Bank’s market cap is Rs. 1,04,579 crore, P/BV ratio is 5.05 times and P/E ratio is 29.78 times. So, at these relative valuations, Bandhan Bank looks grossly expensive to me. Note: Market Caps and Market Prices are dated March 15, 2018. Book Values are of March 31, 2017. EPS have been annualised taking 9-month EPS as on December 31, 2017. IFC bought its stake in Bandhan Bank 2 years back in February 2016 at Rs. 42.93 a share for a total investment of Rs. 232 crore. I have no doubt that the bank has done remarkably well to grow itself multifold in the last 2 years. But, even then, does the bank really deserve a 9-times jump in its asking value within a span of just 2 years? More recently, in December 2017, Bandhan’s MD & CEO, Chandra Shekhar Ghosh, exercised his right to acquire the bank’s shares at Rs. 180 a share through equity stock options (ESOPs). Though it has been done in a fair manner and he has all the right to do so as he has worked hard for the bank, I think it would have been better had the bank left something on the table for the investors too. Given the bank is growing at a speed no other bank is growing, I think it has the potential of giving listing gains to its investors. But, the big question is – should you invest in this IPO just for its expected listing gains? I don’t think so. You need to ask yourself whether I am investing in stock markets just for having listing gains in an IPO or to create long term wealth for myself. I think the valuations are stretched for this IPO and it could have a big fall if the market sentiment takes a U-turn from here, or there is some kind of a red flag for the company. Author Shiv KukrejaPosted on March 16, 2018 March 21, 2018 Categories IPO/NFO15 Comments on Bandhan Bank IPO Review – Should You Invest or Not @ Rs. 370-375?